The holiday season is here. I’m sure you have seen the toy books in the mail, or more likely your kids have brought them to you with all the things circled! One of the hottest toys this season is the Thomas & Friends Super Station. 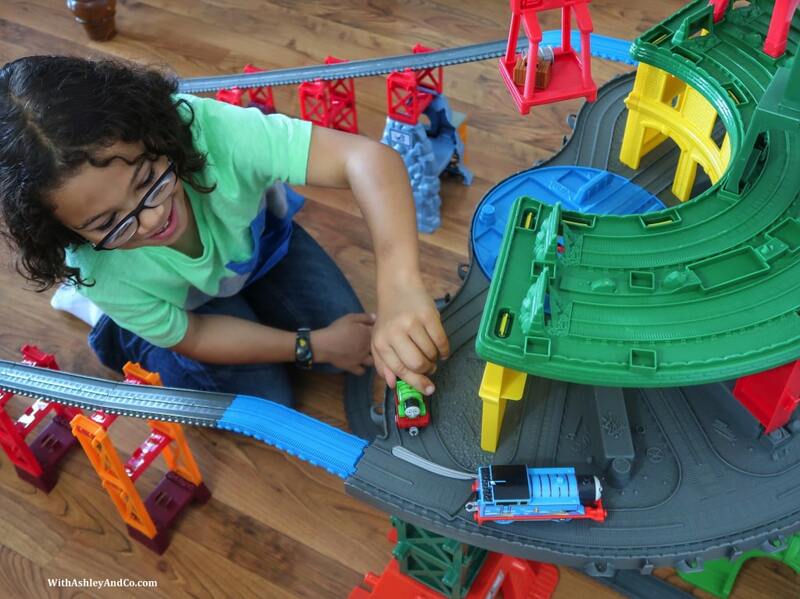 This isn’t just any Thomas the train set, this is the ultimate set that your little train fan is going to love. Thomas has been a friend to our family since my husband and I were little. I remember watching the TV show and playing with the trains as child. My son came along and is into anything with wheels. If he can drive it, he wants to play with it. 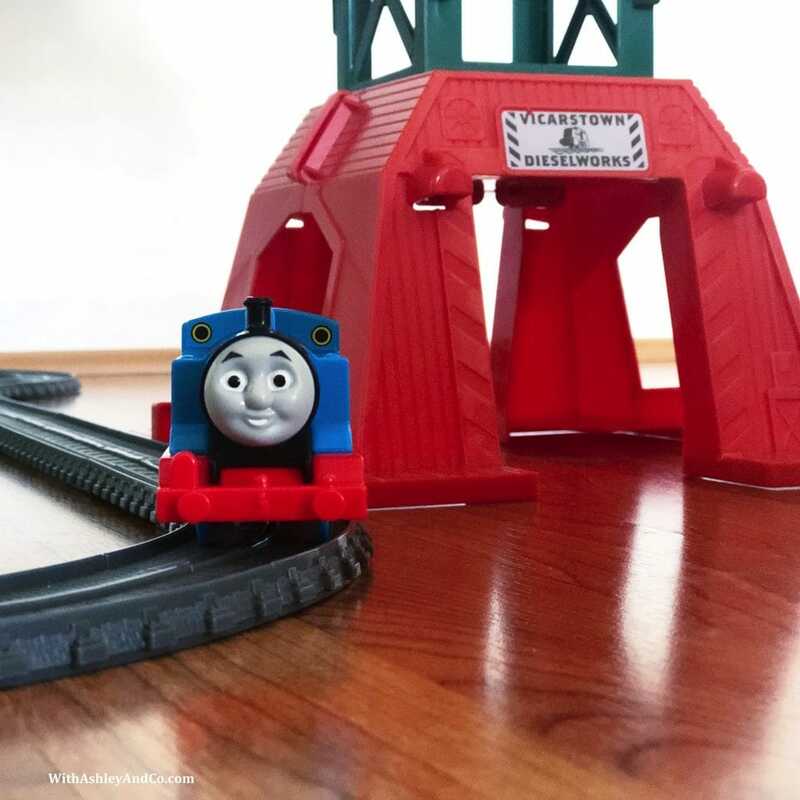 Over the years his Thomas collection has grown and just when I thought it couldn’t get better, Mattel introduced the new Thomas & Friends Super Station. 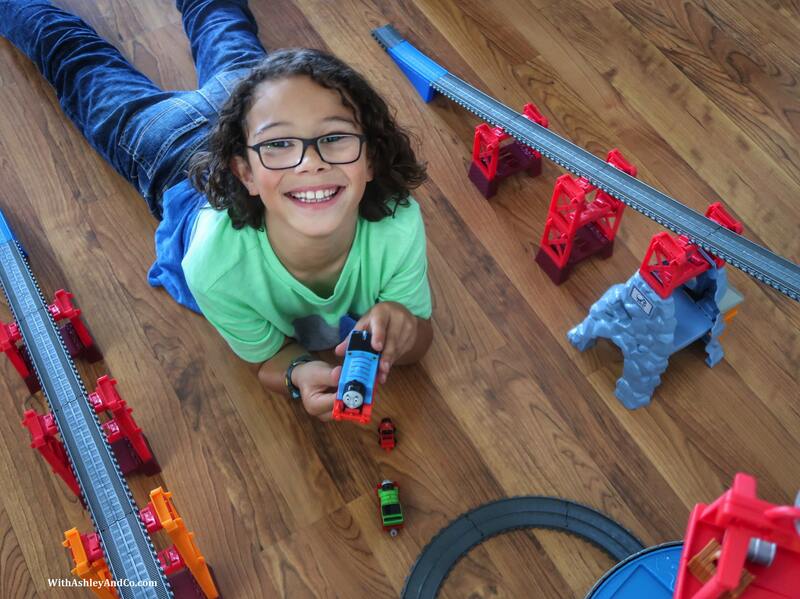 This multi-system track set includes 3 levels of play and comes with Thomas (TrackMaster), Percy (Fisher-Price Thomas & Friends Adventures), James (Minis) and Harold. 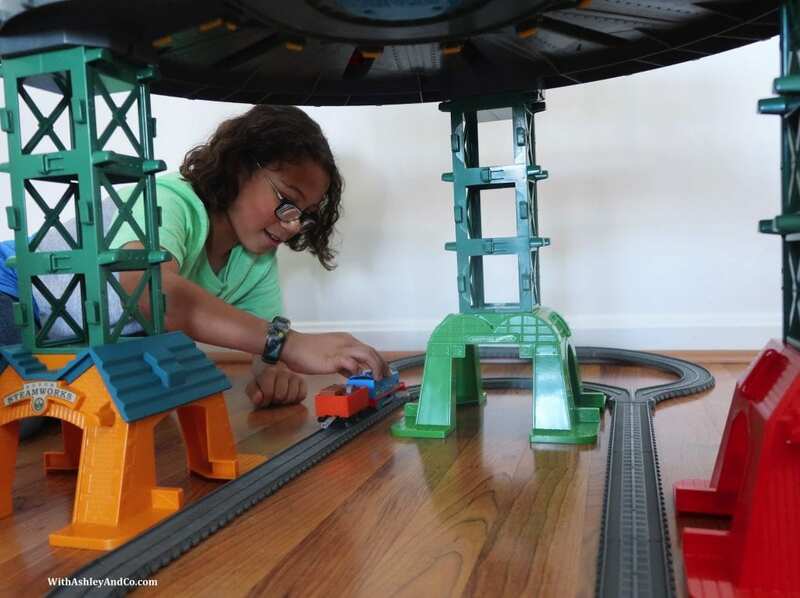 The set itself seems ginormous, but the multiple configurations allow for the Thomas Super Station to fit any space inside your home! If you’re worried about your children’s current Thomas and Friends collection working with this new Super Station, don’t be. This Thomas set is compatible with most Thomas engines. 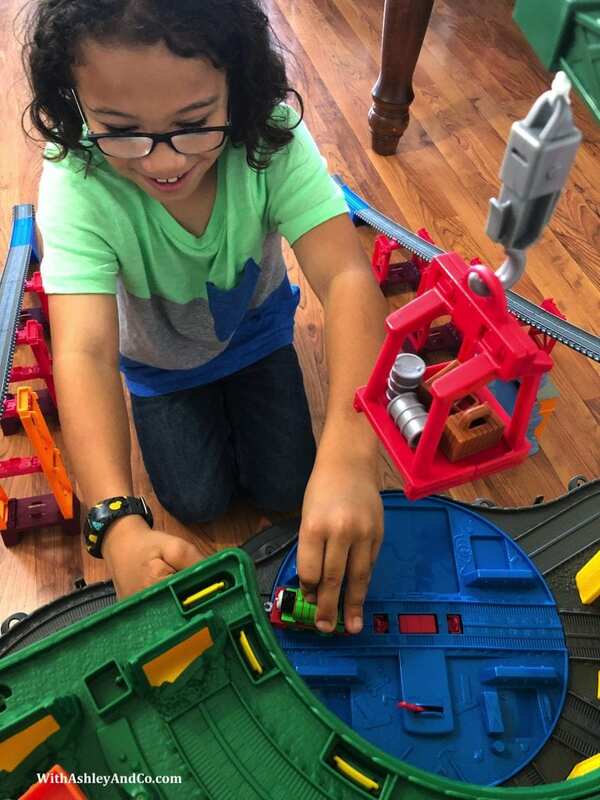 It includes track adapters to connect to Fisher-Price Thomas & Friends Adventures, TrackMaster and Wooden Railway play sets. Plus it holds over 100 engines! This truly is the ultimate Thomas & Friends playset! Not only is the Super Station able to be used with most Thomas & Friends engines, but the ability to change the track layouts is awesome. This set features over 35 feet of track and iconic Thomas locations including Tidmouth Sheds, Brendam Docks, Knapford Station, the Sodor Steamworks, the Dieselworks, Blue Mountain Quarry and the SSRC with Harold’s helipad. Cranky the Crane is around to help get that cargo into the trains and where it needs to go. 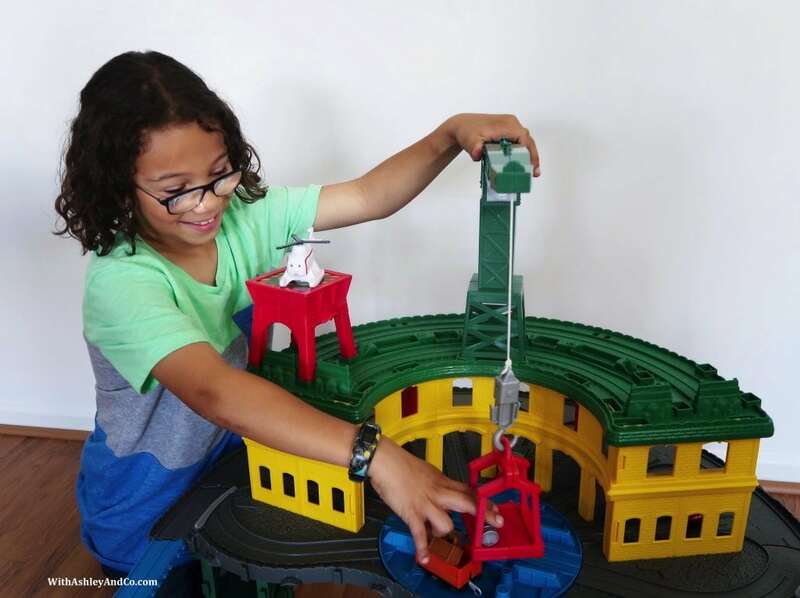 Your little conductor can use the turntable, complete with a stop-track lever, to halt TrackMaster engines and change directions. 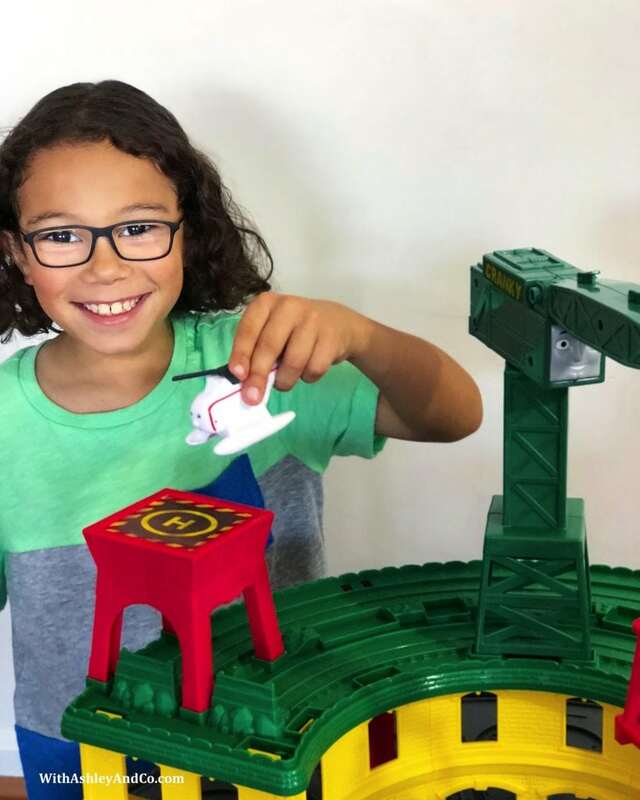 Go mini by removing the legs to create a micro layout for smaller spaces or build it up and out to create the ultimate racetrack for your trains. The legs and locations also feature tunnels and areas for storage too. What my son loves most about this set is that he can customize it to fit his level of play for the day. 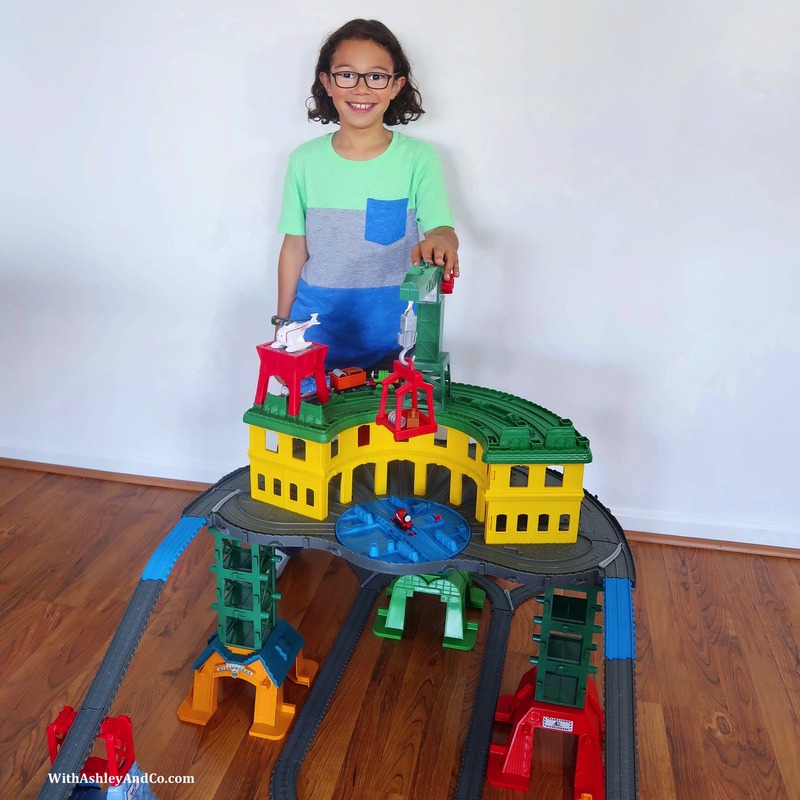 He can use his creativity to change it from a giant track in the playroom to a smaller one that can fit in his room. As a mom I love that the Thomas Super Station will work with all his current Thomas & Friends engines and tracks. They are saving me money and the frustration of “will this work?” No more returning trains after Christmas that aren”t compatible. And all the parents said- Thank you! From my kiddo to yours, this is a must have gift under the tree! He hasn’t stopped playing with this since we unboxed it and his friends were enthralled with it during our last playdate. I call that a win. Get your Thomas & Friends Super Station today at Walmart! I know my grandkids like trains so thinking they would really have fun with this Thomas the Train set. Will have to check with my daughter to make sure. This looks like such a fun toy. I can see kids loving this. It would be a great add to a Christmas list, that’s for sure. I know exactly who I would get this far. My nephew loves Thomas the train and with Christmas coming up this is a perfect gift for him. Wowzwers this is really a nice set of toy. I know my girls would have loved playing with this if they were younger because they had quite a stash of Thomas toys. This train station looks so awesome. It would be such a great gift for the holidays. I know a few people that would love this!! I had no idea Thomas the Tank Engine was still popular! My nephew was absolutely obsessed with it when he was a little boy. This looks like a lot of fun. Our daughter loved Thomas when she was young. This would make a good gift for kids this holiday season for sure. This looks like the perfect toy to get for the holidays. My nephew would love this. When I taught summer school Thomas was so popular with the kids! I had to read at least one Thomas book every day! Now this looks like an amazing train set! I know one of my nephews would LOVE this!! Wow, that looks like an interesting toy to play with. I think my daughter will be too old for that though. Wow! This is definitely perfect for kids so cool to have this. Thanks for the wonderful recommendation. My little one is such a fan of Thomas! I bet she would love to get this. Oh wow my youngest would LOVE this! He is Thomas mad! I haven’t’ seen it before, maybe santa will bring it! Wow! It is so big and versatile. What a great way to encourage imagination and creativity. Cool toy, my kids love Thomas and friends, I will check it out, if it is not expensive I will try to get them. My little nephew really loves Thomas and Friends, he has a pair of clothes with Thomas and friends print and he loves it, it’s his favorite. I guess this would be a perfect gift for him this Christmas.